Because it's not knitting, and an update at this stage would be huge. It's too close to bedtime for that much effort anyway. 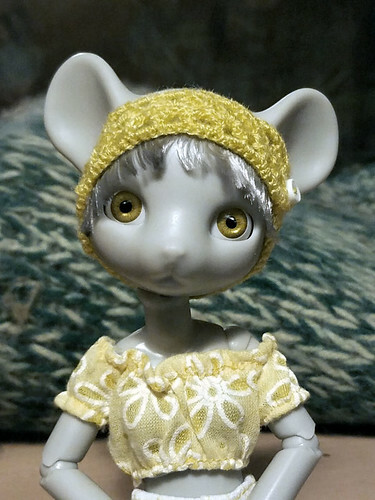 Just a quick little headband for Fiona, my Hujoo Phoebe Mouse girl. The bangs are a bit of boa/eyelash yarn that I tucked under the edge. Crocheted with one ply of vintage Red Heart Lustersheen on a US #7 (1.65mm) steel hook. I've been working on a wig for her but the first attempt stalled at the bare wig cap stage due to engineering problems. I'll probably finish it up eventually, but she will need a head bang to keep the bits in front of her ears down I think.